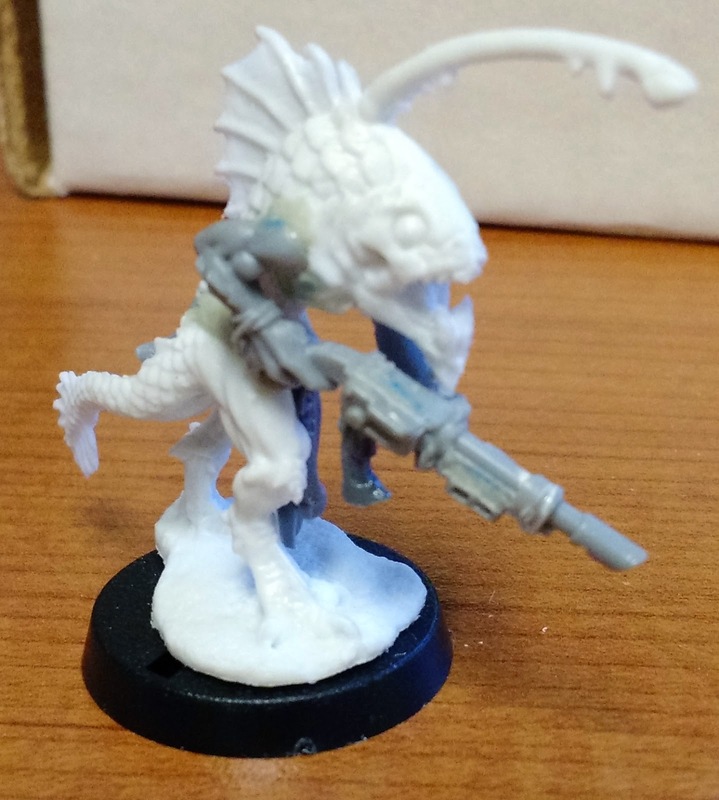 A classic fishman, as needed by all right thinking scifi games. I am still undecided if I should give him a breathing tank of some sort, and if he needs a technological lamp to go with his organic one. The Bones material does not photograph very well, being stark white and slightly translucent in extremities, but it is super easy to convert, as a sharp knife will remove any unwanted details (in this case his original arms). I have only started to paint a Bones figure, so I can not say how easy it is over all, but it seems to take paint like normal, and of course it is super light and flexible. 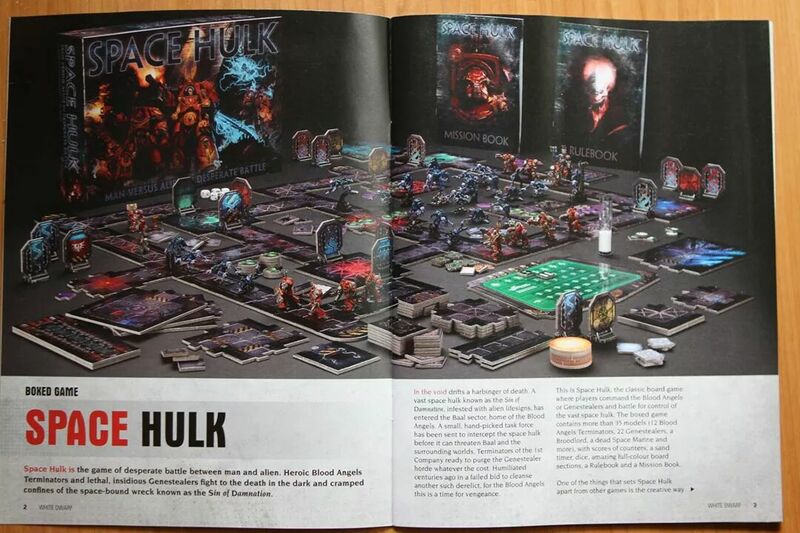 Prior to the release of the Necromunda game, Games Workshop had a set of rules released through White Dwarf that trod some of the same ground, and indeed featured skirmishes between rival gangs set in the Hives of Necromunda. However, instead of gangs based on nation sized noble houses, Confrontation had gangs based more on profession, or social status. 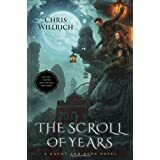 One of those gangs was the Venators, or professional bounty hunters, as discussed here on the Leadplague blog. I still need to sand the putty again, and these are but hasty camera phone pictures, but you get the idea. 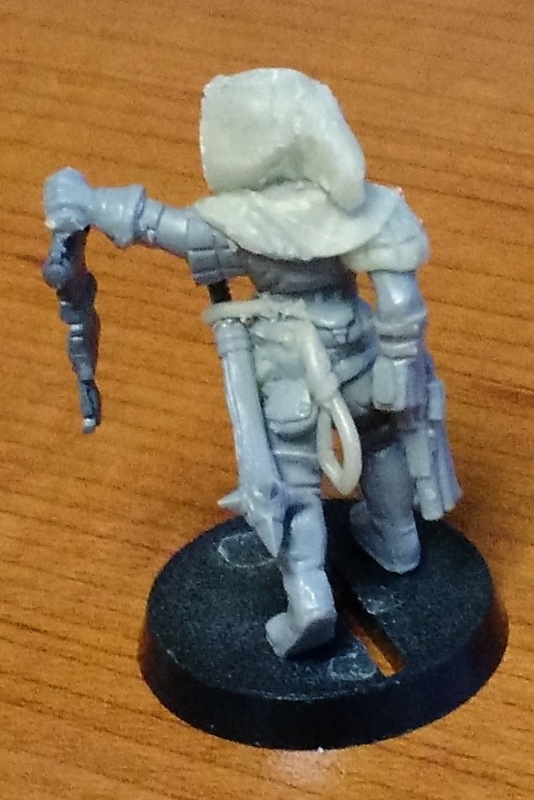 I used empire militia legs, a Bretonnian archer torso, an old Necromunda Orlock pistol, and a space marine scroll as the "warrant". The head is made from a 6th Edition empire drummer head, and half of a Sanguineous death mask. For Inquisitor he is equipped pretty lightly with a Stubgun and a club, but most of the time I am sure that it suffices. I do not know about you, but there are some items that I "chase" on Ebay, always submitting the same low bids in the hope that someday an item will go unnoticed by others and I will win without having to spend much money. To help me do this, I have my Ebay feed set up to show certain items, like Bretonnians, Rebel Blockade runners, or Revell Gunships etc. 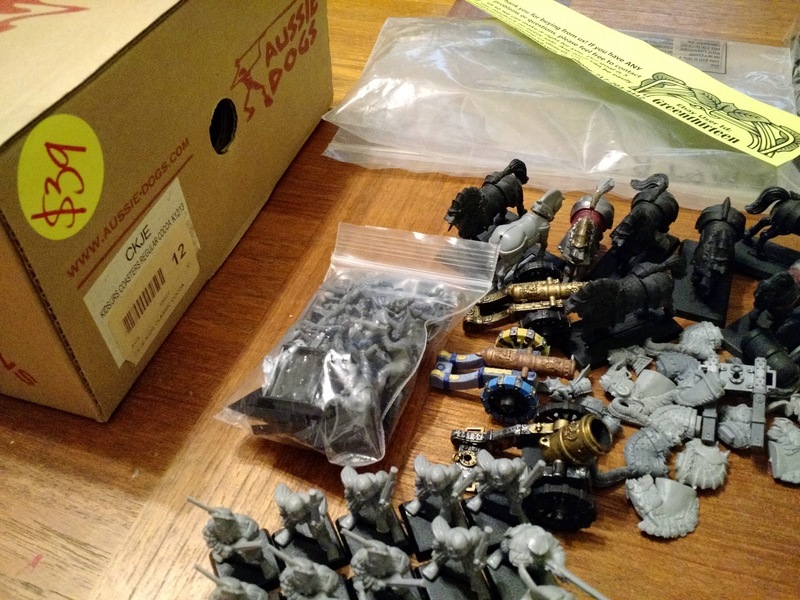 One of those items is the Warhammer Chaos Battalion, which as I have previously mentioned, is a rather good deal at ~$2.34 a figure. Naturally, I wanted to pay less than full price to make it even more of a deal. I was not entirely sure what I was getting in the mail, but the day after Christmas a large, and extremely well packed box turned up. 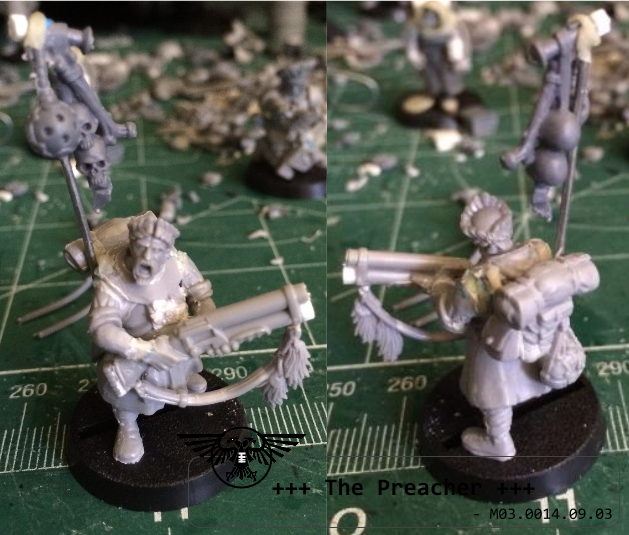 10 current Empire Handgunners/crossbowmen with all bitz, un-assembled. 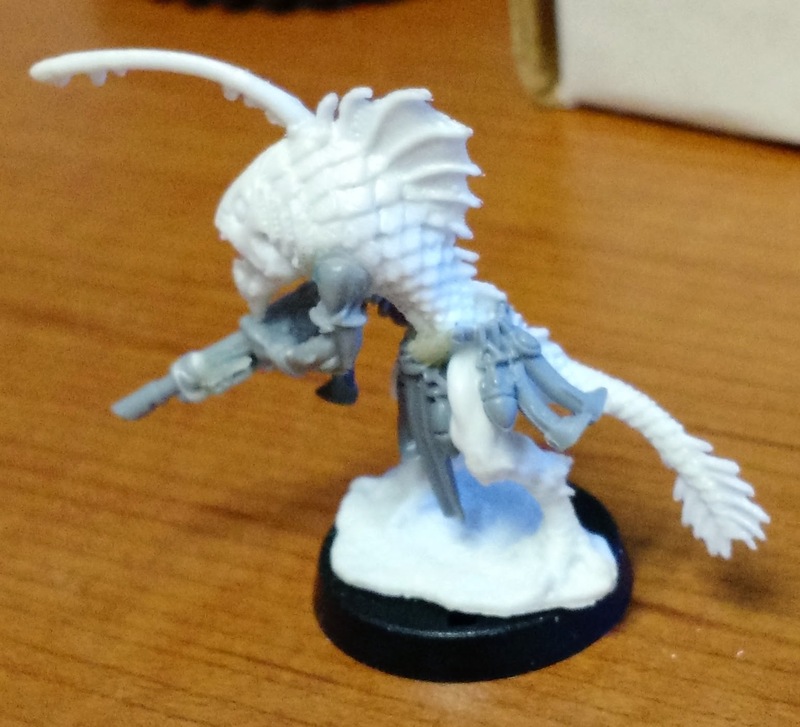 plus a bunch of truly random things like an Eldar Guardian body, or Gretchen heads. So yeah, I was am a bit excited. What about you? Have you ever had an Ebay score like that? I hope everyone had a great Christmas. I certainly did, although with two little kids, family events, and some illness, it was busy. 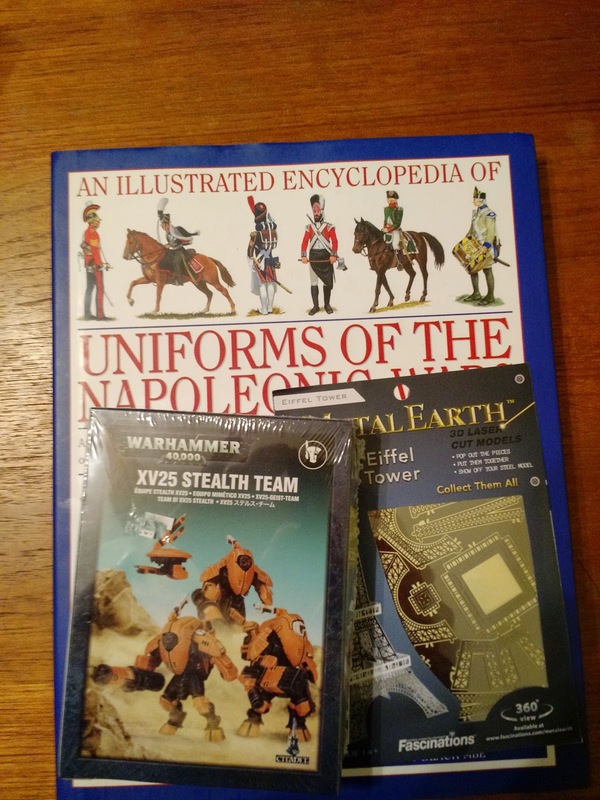 I did not get much in the way of "hobby" materials this year, although I did get a Tau stealth team from my sister, and a Uniform book for the Napoleonic wars from my parents, which should be interesting reading, and useful for future projects. The final "hobby" item is a MetalEarth Eiffel Tower, which uses laser cut metal rather like photo etch to build up the Eiffel tower. Looks like a fun challenge. The older kid got a ton of Lego, so we have been busy building all of that stuff too. And Happy New Year! 2015 should be very interesting. 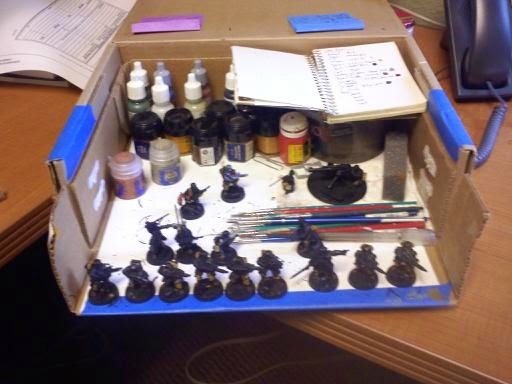 As you might recall, Pro Gloria was running an Indiegogo campaign to get a plastic Landsknecht regiment box produced. There was some sort of stall in the campaign, and rumors of a big announcement, and now it appears that Pro Gloria has been sold to Warlord Games. Apparently Stephen Huber (the former owner of Pro Gloria) will remain connected to the project in some lesser way, which is good, since he seems to have a passion for the project. 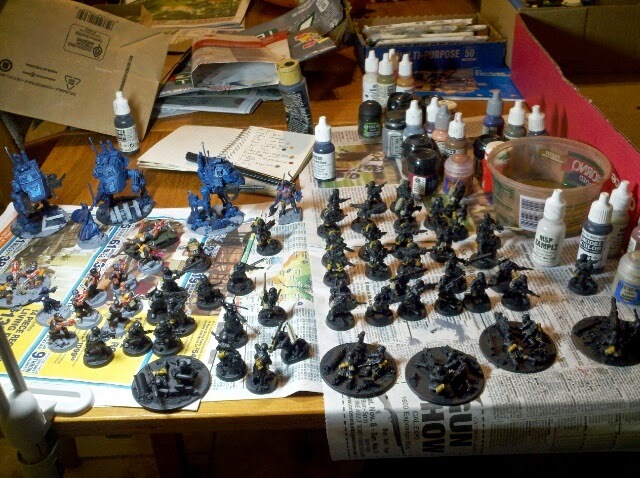 Of course, I cheated and brought the more interesting portions of the army to paint, i.e. the command squad and the attached grenadier squad. 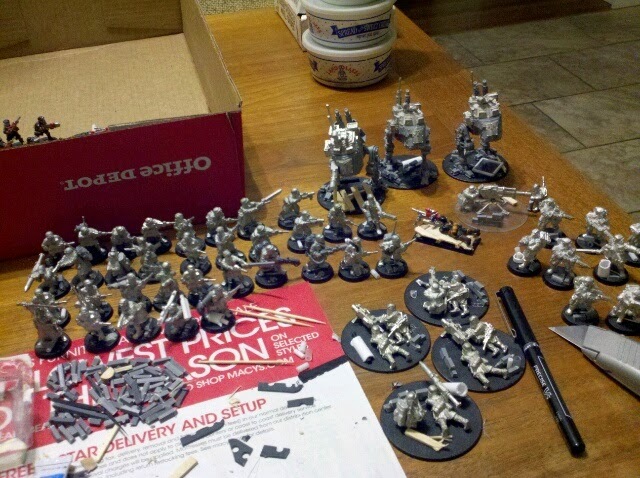 I keep saying "army" but really I am painting a rifle platoon, plus three sentinels, and an attached grenadier squad, seconded from the battalion. The rifle platoon has a command squad, 4 rifle squads, and a heavy machine gun squad for a total of 51 effectives. 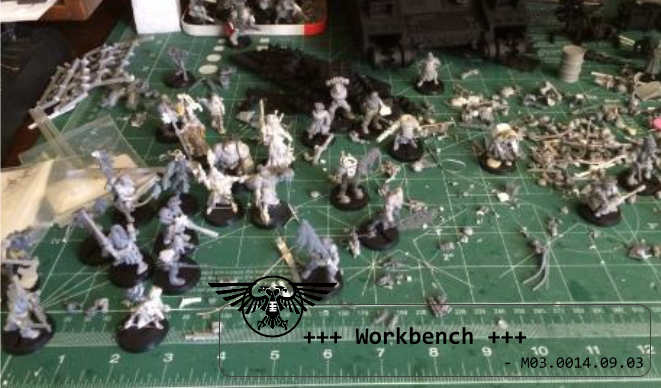 I am also in the process of converting a few company level assets, such as a heavy mortar squad and it occurred to me that maybe I could build and paint a full company. Mostly because I have more conversion ideas... Yes, I am crazy. This might not look like four hours of work, but it is... painted pants, bedrolls, canteens, and a few other things for the 50+ figures. I also completed a test figure for the Storm Troopers. Under the Ott Light, you can see the difference between rattle can flat black and airbrushed Reaper Nightmare Black. One of them is extremely blue. Well, that did not go as planned. As I mentioned last night (this morning?) I was going to prime all my figures with the airbrush. Did not work out. I have not used the thing for 8 years, and only once before that, so I probably should have scheduled in some time for troubleshooting. And I ran out of black paint. And the Reaper "Nightmare Black" paint that I got as a Halloween freebie... is actually very dark blue. So I stopped at Home Depot after my nephew's soccer game this morning, picked up a rattle can of flat black, and had everything primed in 15 minutes. I still want to use that darn airbrush, but I will have to take some more time to practice first. 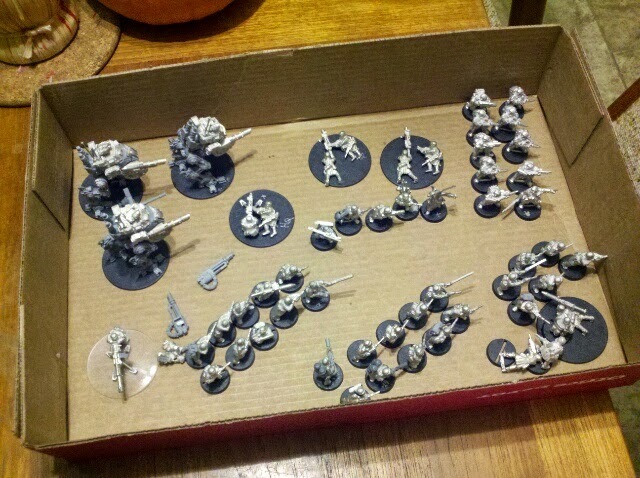 Just finished the basing of my little army project... now on to airbrush priming. I may have gone a bit overboard with basing, as I built a destroyed sash window, a wooden floor, fence, and a few other crazy things, using time that would have been better spent painting. Lots of people use sprue for bricks, but how many use a chopper to make them all the same size? Similar to my earlier post about painting at work, I have been sculpting at work lately. 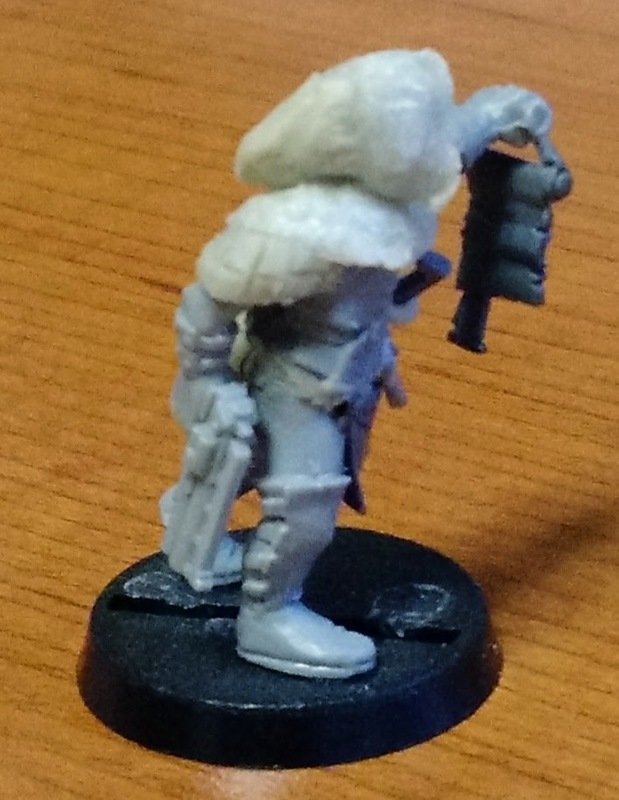 mostly this is gap filling and the like for my various Inq28 figures, but I have added straps, fur, pistol holsters and a few more ambitious items. 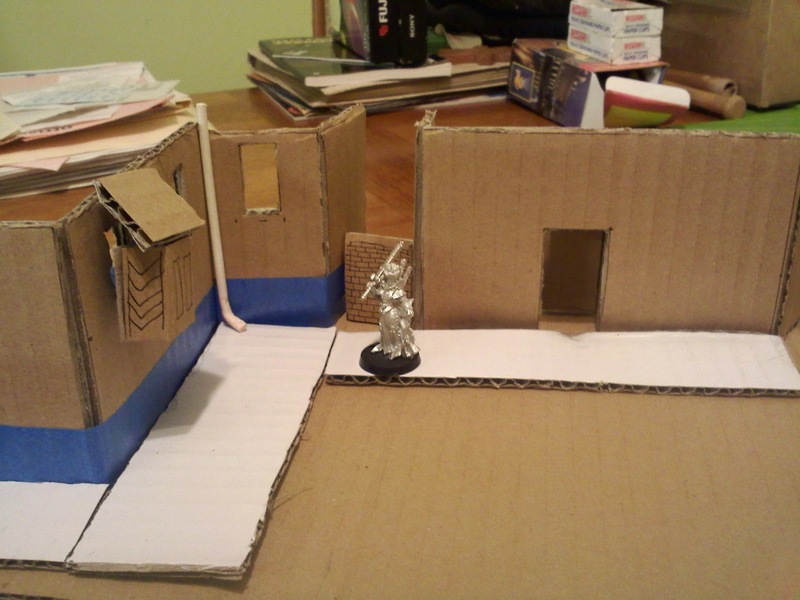 The box is one of those old Games Workshop bitz boxes that I seem to have a few of, and it suffices for this use. 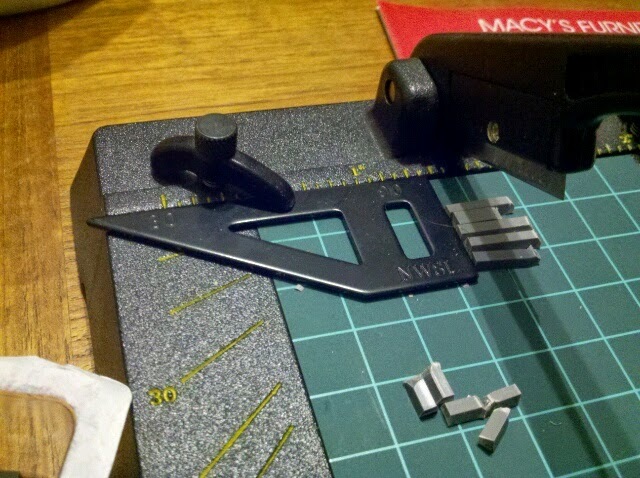 I carry a file, a needle pointer, a spearhead sculpting tool, and a custom made "lifter" tool I made from some sprue. I use Apoxie sculpt exclusively these days, partly because it is water soluble (meaning easy cleanup) and partly because it is in the little plastic containers and thus has not dried up. A bottom of a water bottle holds a bit of water for me to dip my tools in, piece of tape to hold figures and bitz during transit, and we are done. Today I finished these three Steel Legionaries, two of whom have been converted to carry flamers, and one who has a single shot anti tank missile strapped to his back (for use in SGII battles). Higher level rewards and add-ons are of course available. 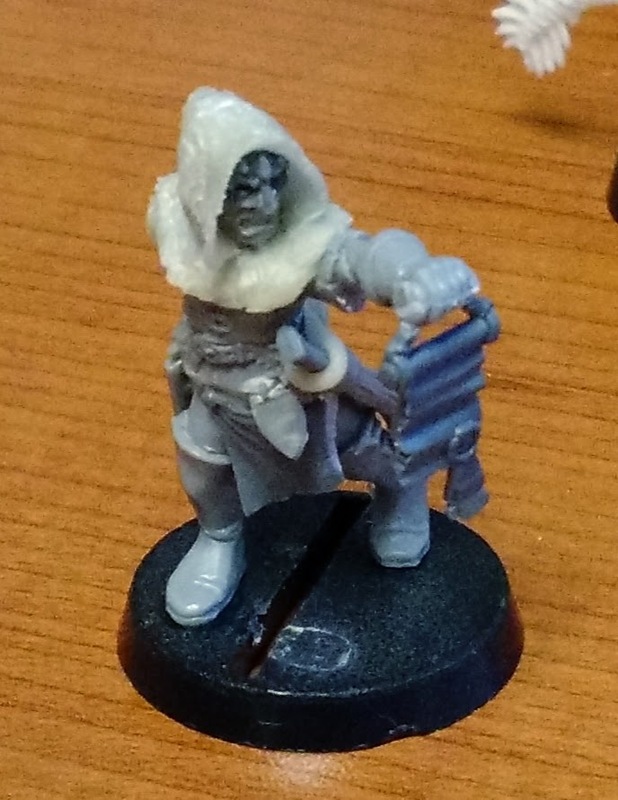 As of this writing the campaign is at ~15% of its goal, but I think it will make it, if not here, than later, since the figures are already sculpted. I do not think I am going to be taking part in this, since I have plenty of pikemen currently, but I hope that this comes to fruition sooner or later... because I will eventually need more, and they look great. During October Reaper Miniatures has had two Halloween related promotions going on, one that has their usual "Ghoulie Bag" with a trick or treat figure (you can see how that worked out for me last time), and a second where they are selling cutsie large headed monsters (Boneslyvanians, although in metal). When they were first announced, I sent the picture of the Boneslyvanians to my wife, and she mentioned that they were "cute", particularly "Gil" the little guy reminiscent of the creature from the Black Lagoon. And so an order was put together... the hard part was keeping the costs contained, since my rough list of things I liked and might want to get was well over $100 (and with the bones figures running ~$2.50, you can imagine how large the list was!). 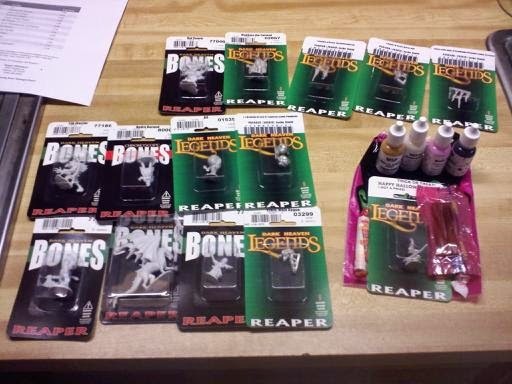 In the end, I got a few figures for INQ28, a few D&D figures, a few Halloween related figures, and some bits. In my Ghoulie bag, I got a few pieces of candy, some paint, and Elise the Witch... not the most kid friendly model. I had hoped to get the order before Halloween to get some painting done, but it did not work out, so maybe I will be painting late tonight. 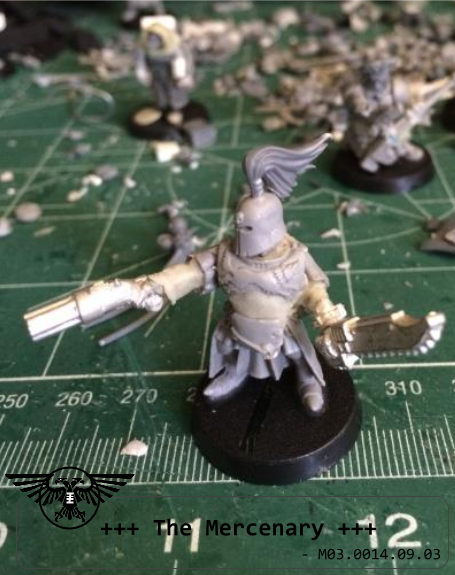 You may recall my previous post about the Warmaster Army selector, writen by Dave Susco. Well, today I discovered that he has a company called Warmonger Miniatures which sells 10mm figures designed for, wait for it, Warmaster. These figures were created as part of a kickstarter campaign, which I honestly never even heard of. In any case, the campaign was partly successful, and now these two units are available from Warmonger Miniatures at the nice cost of $10 a unit. Once I finish off my warmaster army [so, 2020?] then I will be interested in adding more units, and these fit the bill nicely. 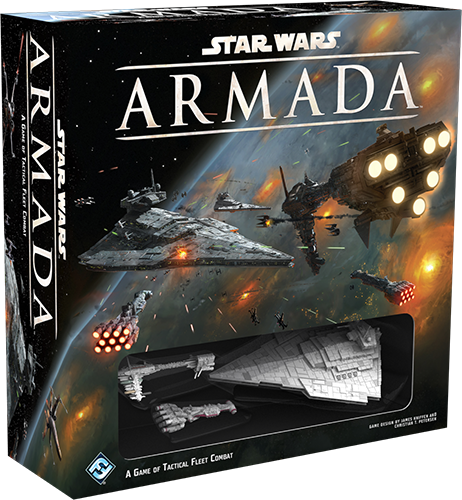 And they seem to have a humdinger here with Star Wars Armada, a new fleet level Star Wars game. 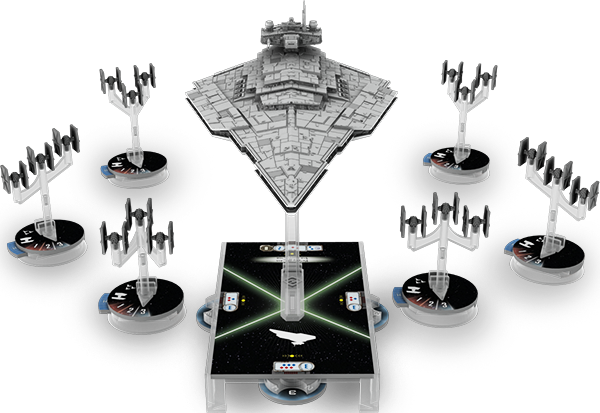 Expected to ring in at $100 MSRP, this will have prepainted ships (Victory class, a Nebulon B, and a Corvette) with a wealth of accessories, chits, and cards. 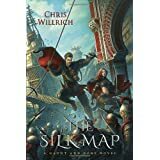 So... tentatively excited about this, since big ship battles are even more interesting to me than fighter skirmishes, and it seems to have some interesting mechanics to make the ships seem slow and lumbering (stacked orders, slow movements with the ruler). The components should be high quality, and may help with the "paperwork" of fleet battles with all the integrated little dials and stats. However, the cost, and obvious scale issues are things to keep aware of, so let us wait and see what happens and what is released. Whilst browsing the Rick's Warmaster site today, I saw in the "what is new" section, that there was a link to a handy automatic army selector for Warmaster. 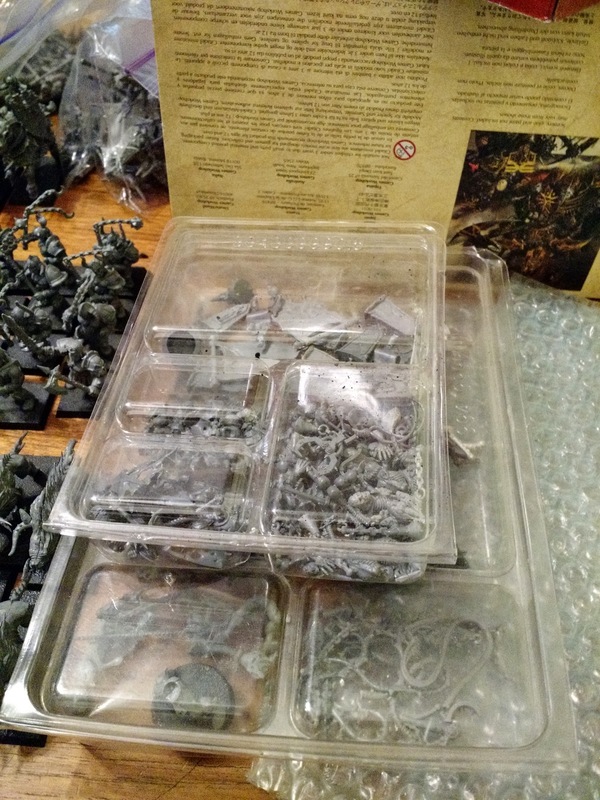 Created by Dave Susco, the army selector actually helps to build armies for Warmaster, Warmaster Trial Armies, Warmaster Ancients, and a few of the Warmaster Ancients Army book armies. Not only does it have the rules for army building, and the upgrades, and various alerts about having 1 of x per 1000 points, it also has the ability to save and print lists, and when you print out a list, it has options to include all the stats, special rules or just the ones used, rules for magic items used, and spells (provided you are playing Warmaster Fantasy!). It does not appear to have the additional special units added to Warmaster Fantasty, such as elite handgunners, or the Swordmasters of Hoeth, but considering those are both rare and OOP, it is to be understood. Anyway, this Warmaster Army Selector is pretty handy if you are into any of the official Warmaster variants, or just like to play around with list making. 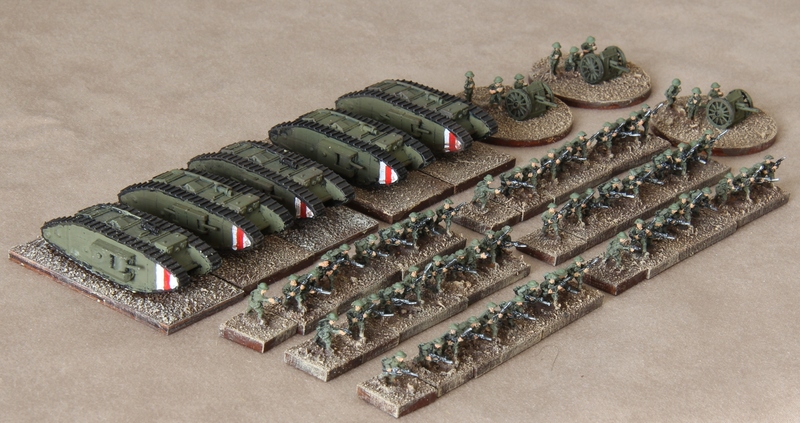 As it seems to be the season for it, I have been interested in putting together a small Great War collection of 10mm figures, aiming at a company for each of the major combatants in the West, some regimental or divisional support weapons, and a few "fun" bits like tanks and trucks and what not that give a good period flavor. I have had a surprising amount of trouble finding online breakdowns of the composition of battalions during this period, with most of it being for 1914, and therefore not accounting for all the technological and structural developments that occurred as the war went on. When I was doing similar research for WWII I found tons of information. I guess since most of the battles were such large scale, that people must be ignoring the company/platoon level combat? To me anyway, the tactical aspects of running a company or battalion seems far more interesting than the more meat grinder aspects of clashing divisions together. I priced out a couple of companies (at roughly 1:1) from Pendraken directly, and the Warstore as an importer. Interestingly, the Warstore comes out significantly cheaper, partly due to shipping (£19 from the UK, or $7 from NY), but each pack is cheaper as well. The general idea is to "upsize" skirmish rules and have a 28mm figure replaced by a half squad/section base of 10mm figures. Obviously this will need some modifications, particularly with regard to "wounds" or movement ranges, but I think it will generally work well, and with some trench terrain, will look quite nice as well. Over on TMP I saw a thread about WWI using Rapid Fire, and found this interesting basing system, where infantry figures are mounted in strips 15mm deep, and special weapons are mounted on 25mm rounds, which seems like it would work out pretty nicely. Copplestone has some new 10mm Fantasy, which is certainly surprising, as there have not been any releases for 10mm for some time. Three new packs at £5.75 a pack, which works out to about $9.70 with today's exchange rate. 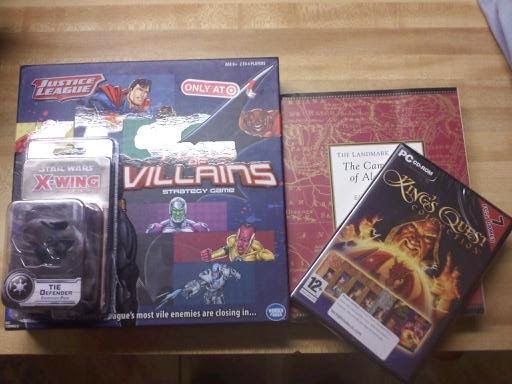 This weekend we celebrated my birthday, and I got some loot that you may find interesting. First is the TIE Defender for the X-wing Miniatures game. The Defender was always my favorite in the old TIE fighter computer game, and it should be pretty powerful in the table top game too. Second is Justice League: Axis of Villains, which is a strategy game about defending the Justice League tower from an onslaught of villains. Third is the King's Quest collection, which collects together the King's Quest games 1-7. I have heard that there are some problems with playing these games on newer computers, but I loved them as a kid, so I will jump through some hoops in order to play them. 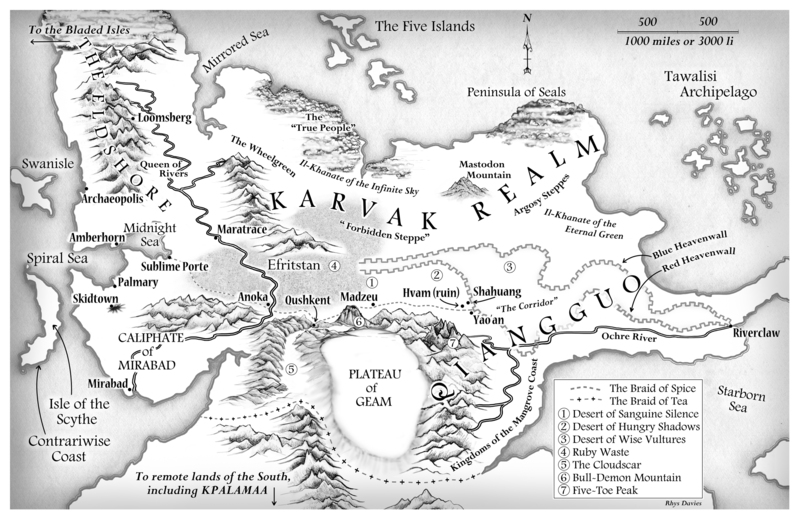 Finally, we have The Landmark edition of the Campaigns of Alexander by Arrian, which I am very excited to read... sometime. However, there should be plenty of gaming ideas in that book, which I look forward to. Sadly, not mine, but one I saw on Iron Mitten. I really love the idea of taking "junk" and making something practical out of it, and since I have one of these same bottles at home, I was staring at it for a while in the shower this morning, thinking about how to make it into something useful for Inq28 or other WH40k/Generic Scifi sort of games. Unfortunately I always start to get carried away, and I was thinking about blue foam shapes for the nose and tail, a chimera turret, vector engines, windows using disposable contact packets, and adding a layered styrene skin to have panels and exposed wiring... at a certain point I need to stop thinking and just make something. 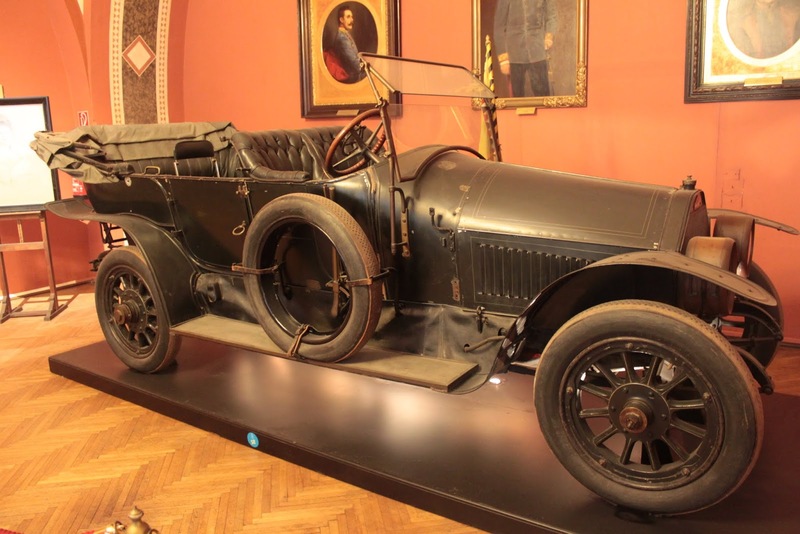 A few days late for this, but 100 years ago Archduke Franz Ferdinand and his wife were shot to death in Sarajevo by Princip, a member of the Black Hand. This was of course the immediate cause of the Great War, which started a month later on 7/28/1914. 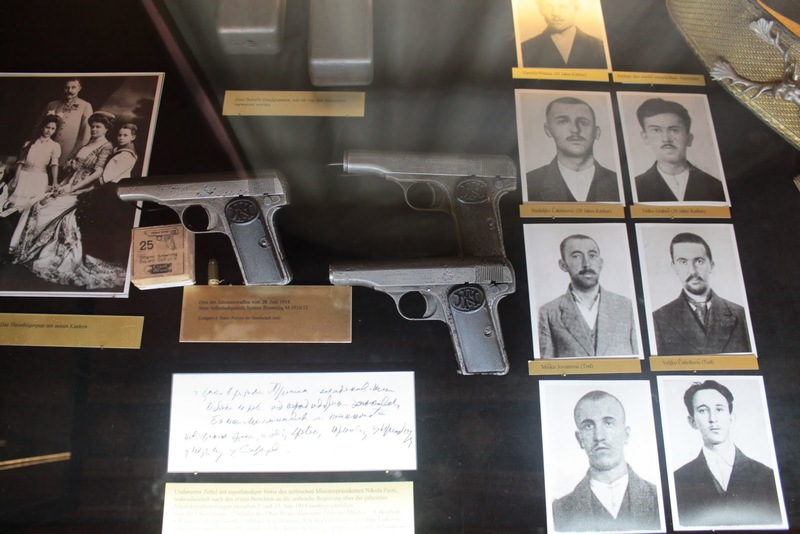 While that war may seem remote to some, it is obviously hugely important to making the contemporary world, with global effects rippling out from a few pistol shots in a far away city. 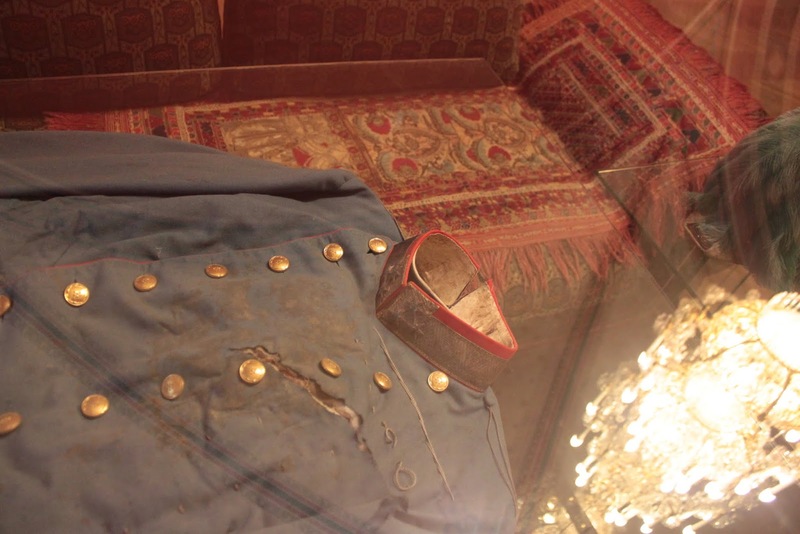 As it happened I visited the Heeresgeschichtliches Museum in Vienna a couple of years ago, where they have a whole room full of artifacts from the shooting, including the car, Archduke Franz's coat, and the pistols of the Black Hand agents captured following the attack. 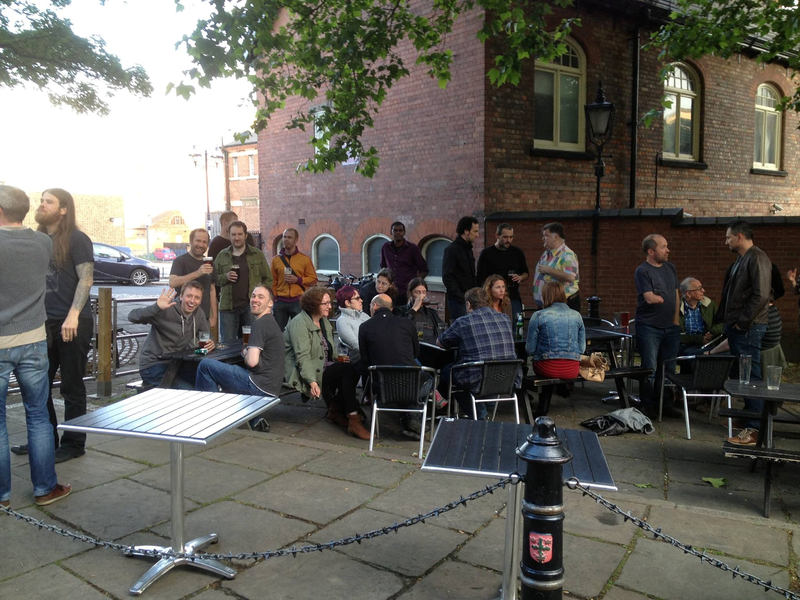 We are aware that there are rumours flying around that we have left Games Workshop! Thought we should set the record straight and let you all know that…we have! 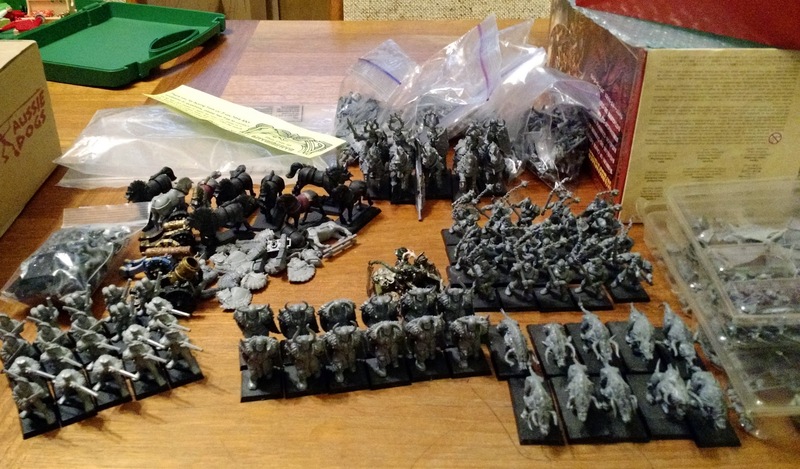 After 36 years, man and boy, working on Warhammer, 40K and of course, for the l...ast 15 years LotR and the Hobbit we are now able to focus our energy on our historical ranges.This means more time to dedicate to Perry Miniatures, and of course Mr Jackson who we continue to make 54mm WW1 figures for. We had an excellent evening on Friday at The Trip to Jerusalem with GW, and ex-GW, colleagues and friends who got us very, very drunk - cheers! Above taken from the Perry Miniatures Facebook page. With the move away from metal and now from individual figures, as well as the end of the LotR/Hobbit run... it only makes sense I suppose. 36 years at GW is more than enough for anyone, although with this departure, it means that there are even fewer "names" left at GW, as they leave for greener pastures. 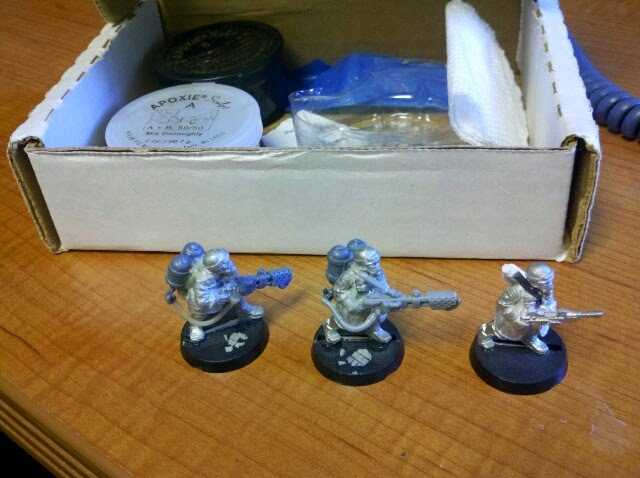 Celebrate by hurrying to the Perry Miniatures website and buying some figures!